What a great bird toy/foraging bird toy.......and it's refillable! Your bird will have hours of fun foraging for his favorite bird toy items. The Hide N Seek bird toy by Caitec comes filled with colorful foraging toys that will peek your bird's curiosity and challenge your feathered friend into foraging for their favorite toys. 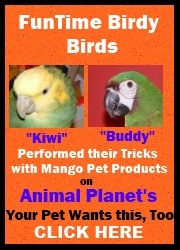 Ten portals (openings) of fun that are smaller than the contained toys will keep your bird interested for hours. As an extra incentive to stimulate foraging for your bird...add their favorite treat inside and watch as they enter Forage Heaven. The Hide N Seek is made out of impact polycarbonate and is very durable. It easily secures to the cage bars with the included screw on attachment. The entire back of the Hide N Seek toy opens for Hide N Seek Refills to be easily placed back in. Hide N Seek Foraging Bird Toy by Caitec5Pat GilsonApril 12, 2018Buzz loves this foraging toy. He has one I bought a couple years ago and now I have purchased this second one for his downstairs play area. It keeps him busy searching out the 'treats' I hide among the paper & blocks. Hide N Seek Foraging Bird Toy by Caitec5Peggy KaplanJune 19, 2014Patti is still scared of this toy, I am hoping she will come around, it takes her awhile to come around. Hide N Seek Foraging Bird Toy by Caitec5Anna MellitasDecember 7, 2013Great toy!. Coco plays for hours and has stopped screaming and other bad habits. Hide N Seek Foraging Bird Toy by Caitec3JoAnn WheelerJuly 4, 2012Kermie, wasn't so impressed with this one, he was very leery of it. After awhile he started to work on it. Hide N Seek Foraging Bird Toy by Caitec4JaneJuly 10, 2011We got this for our young African Grey. She doesn't spend much time inside her cage ...which is where we have this toy installed, but when she does spend time inside her cage - she's poked around at the foraging toy. She has yet to pull anything out that wasn't already hanging out thus far. She was a little leery of it when she first saw it..but that's a Grey for you. I expect her to be more proactive with playing with it once we either mount the toy on the exterior of the cage or up on her playpen or if she does spend more quality time inside her cage.